Jonathan Loughran, the senior vice president of the Irish Film Commission US, is to step down from his position after six years. The LA-based commission is part of the Irish Film Board with Loughran’s role being to promote the Irish Film Industry in Hollywood. He now plans to set up a new production company, ArtCastle, with Irish filmmaker Gary Shore. The IFB will continue its presence in LA and is in the process of putting in place a new set of arrangements so that it can continue to encourage inward investment in film and television productions to Ireland as well as supporting the development of the Irish talent there. The commission’s office has relocated to 8265 Sunset Blvd, Suite 100 in West Hollywood with Naoise Barry’s Dublin office acting as the current point-of-contact until new arrangements are put in place. The Irish Film Board's LA office was opened in 2006 and Loughran was the first senior vice president. The office helped attract over $185m worth of North American productions and IFB-funded projects earned 10 Oscar nominations. Loughran is said to have played a particularly key role in securing projects to shoot in Ireland such as Glenn Close's multi-Oscar nominated ‘Albert Nobbs’, Steven Soderbergh's ‘Haywire’ and ‘The F Word’ starring Daniel Radcliffe..
Last March, Loughran was honoured by the City of Los Angeles at a ceremony in City Hall as one of the Irishmen of the Year for his contribution to Irish culture in North America and was recently named as one of the Hollywood 50 by the Irish Technology Leadership Group. 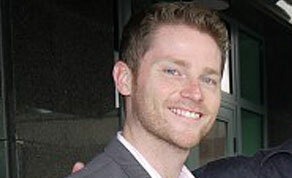 Loughran also co-founded the LA Irish Film Festival in 2008 with Lisa McLaughlin. James Hickey, chief executive of the Irish Film Board said: “Jonathan has spent six very productive years with the IFB during which time he made a huge contribution to the Irish film industry. He has been a valuable and a highly regarded member of staff so it is with the warmest personal regards that we wish Jonathan every success with his new venture". Speaking about his departure Jonathan said: “I have greatly enjoyed the past six years running the IFB's LA office and am looking forward to continuing my close relationship with Ireland and the IFB through my new venture ArtCastle".